We are qualified to provide financial information and assistance to people going through a divorce. Divorce Financial Planning can help determine both the short-term and long-term financial impact of a proposed divorce settlement and help devise alternative settlement proposals. By examining and analyzing the financial issues of a divorce, we provide our clients and their lawyers with data to help strengthen their case. By adding David Kobylar, CPA, Certified Divorce Financial Analyst® (CDFA™, ), your team will include someone who is skilled in analyzing and providing expertise related to the tax and financial issues of divorce. • Identifying the short-term and long-term effects of dividing property. • Analyzing pension and retirement plan issues. • Determining if the client can afford the matrimonial home – and if not, what might be an affordable alternative. • Evaluating the client’s insurance needs. • Establishing assumptions for projecting inflation and rates of return. • Bringing an innovative and creative approach to settling cases. When dividing marital assets, not all assets are treated equal. 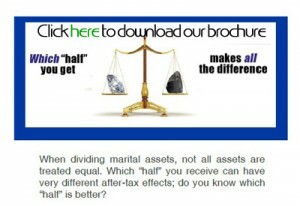 Which “half” you receive can have very different after-tax effects; do you know which “half” is better? Why is a CDFA important to you? Contact a specialist in Divorce Financial Planning in New York for help.